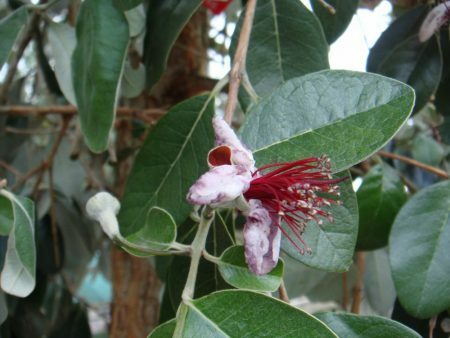 Acca sellowiana, known as the Pineapple Guava, has grey green evergreen leaves which are densely white-felted on the underside. Its unusual flower is dark pink or red and white which emerges pink and white in midsummer. Pineapple Guava thrives on most free draining soils, ideal in hot courtyards and walled gardens. It needs sheltered and south facing positions where temperatures dont get below -5 degrees Celsius.